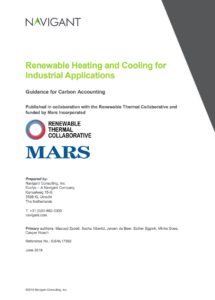 Renewable Heating and Cooling for Industrial Applications: Guidance for Carbon Accounting, was developed by independent research from Ecofys, a Navigant company, and published in collaboration with the Renewable Thermal Collaborative (RTC) with support from Mars Incorporated. Part of the Renewable Energy Buyers Alliance, the RTC is harnessing corporate demand for clean energy purchasing options. The report is the first landscape analysis to assess the many existing methodologies used to calculate emissions impacts of six thermal energy project types and recommends a primary methodology for each.